2-(Chloromethyl)pyridine hydrochloride was used as reagent in base catalyzed alkylation of p-tert-butylcalixarene and p-tert-butylcalixarene in DMF. It was used in the synthesis of Gd3+ diethylenetriaminepentaacetic acid bisamide complex, a Zn2+-sensitive magnetic resonance imaging contrast agent. 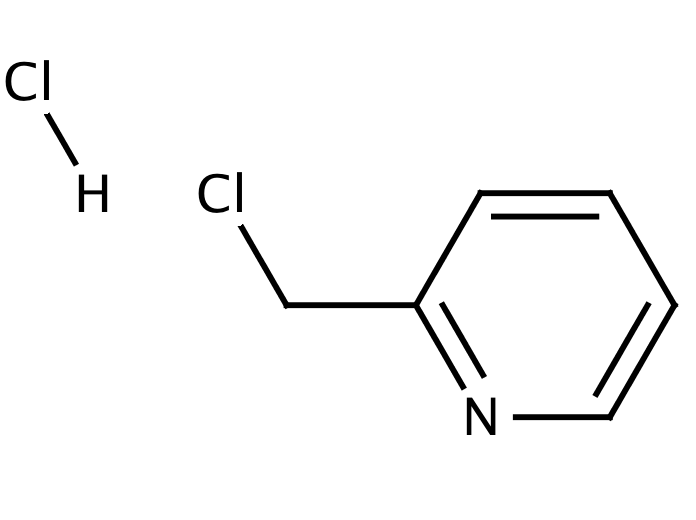 Send us your enquiry for 2-(Chloromethyl) Pyridine Hydrochloride. We offer custom pack sizes at special prices. We aim to respond to your enquiry within 24 hours. We value your input so if you have suggestions regarding new applications for 2-(Chloromethyl) Pyridine Hydrochloride email us and we will include your contribution on the website.